The process of proper document destruction can help reduce your risk of identity theft. When someone mentions the phrase identity theft, we often think that it occurs when our information is stolen by people who hack into computers or our online communications. We try to come up with passwords that are so complicated that no one could ever figure them out. While that is still a good idea, don’t forget that the paper documents that you discard also put you at risk, especially certain kinds of mail. The process of proper document destruction can help reduce your risk of identity theft. 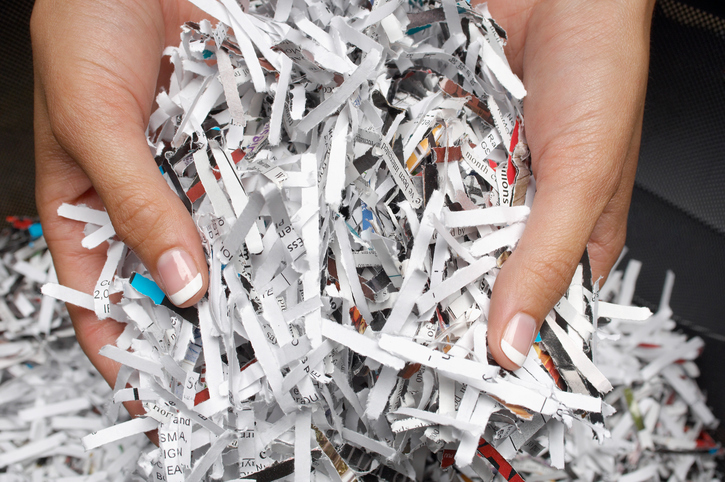 Here are five types of documents that you need to shred to help prevent identity theft. This is what criminals want: anything that has your birth date or social security number. Be careful discarding documents that have your driver’s license number. Each piece of mail that has your address and phone numbers puts you at risk. Destroy these documents by shredding them. Any mail that you receive that includes your account information needs to be properly destroyed. All of your credit card statements, phone bills, and even bills for utilities at your home or rental properties have details that thieves can steal and use. Shred all of these when you are ready to discard them. People who steal identities look for mail from financial institutions because it could have all kinds of identifying information that they can steal and use. Don’t forget about your credit card statements. Keep copies for three years. After that, you can get rid of them as long as you shred them. Document destruction is key to keeping yourself safe from identity theft. The problem of identity theft isn’t limited to adults. Children have social security numbers, too. If you receive a copy of a birth certificate, it should go in the shredder. Any mail that comes from school could have personal information and should be destroyed. This includes applications, trip permission forms, and even copies of report cards. Most of us don’t think twice about tossing catalogs, flyers, oversized postcards and other pieces of junk mail into the trash. This is a mistake. Barcodes on the front may contain information that can identify you. Some pieces of mail like credit card offers include your personal information. Documents from insurance companies as well as organizations and associations that you belong to may contain sensitive data, so be sure to shred all of your junk mail. This entry was posted on Friday, December 22nd, 2017 at 4:17 pm. Both comments and pings are currently closed.